Seamon's short stories have recently appeared in Bellevue Literary Review, Fiction International, The Greensboro Review, The Nebraska Review, Persimmon Tree, and The Chicago Review. Her work has been included in anthologies such as The Best of the Bellevue Literary Review (Bellevue Literary Press, 2008), Celestial Electric Set (Emrys Foundation, 2008), and The Strange History of Suzanne LaFleshe and Other Stories of Women and Fatness (The Feminist Press, 2003). Her short story “Death is the New Sleep” won the 2009 Al Blanchard Award for Short Crime Fiction and was included in Quarry: Crime Stories by New England Writiers (Level Best Books, 2010). Richard Casey has terminal cancer. He’s living in hospice, but one thing sets him apart from the other patients there. He’s only seventeen. Somebody Up There Hates You could have turned into the typical heart-breaking tale of a dying boy, but it didn’t. Richard was the comic relief as a main character. He is determined to live every day to the fullest even as his health deteriorates. Somebody Up There Hates You takes you through Richard losing his virginity, getting drunk for the first time, and growing up in a place where no kid should have to grow up. Richard focuses on falling in love, making memories with his family, and being a normal teenager. I really enjoyed reading Somebody Up There Hates You. It was heart-warming and yes, sad, but not so sad that I needed to lay in my bed and cry all day. This novel was a great story of overcoming your problems and staying positive even in the worst of situations. Seamon created a very original story out of a topic that has been written about time and time again. I think that shows real talent as a writer. Algonquin has provided Steph's Stacks with some extra scoop in the form of an article by Hollis Seamon adding extra insight into the story behind Somebody Up There Hates You and it's hero, Richie. 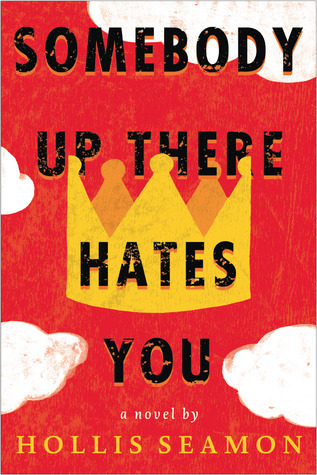 We ended up with an extra ARC* of Somebody Up There Hates You at BEA and would love to give it to YOU. So, easy-peasy, just fill out the Rafflecopter form below to win! My favorite read so far this year has been The Life List by Lori Nelson Spielman. I've read over 30 books the past 2 months, and I can confidently say that the Delirium series was definitely my favorite read! Difficult choice for favourite read, I would have to say The Almond Tree by Michelle Cohen Corsanti.